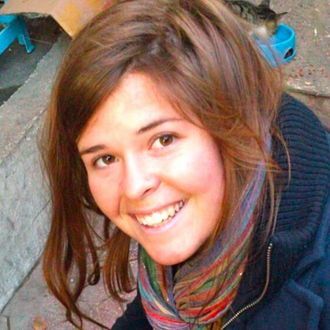 ISIS’s last American hostage, aid worker Kayla Mueller, has been confirmed dead. Her death was first announced on Friday, when the terrorist group said that she had been killed in a Jordanian air strike near Raqqa, Syria. At the time, the United States and Jordan were skeptical of ISIS’s story, and the 26-year-old’s family said they were “still hopeful” that their daughter was alive. But, CNN reports, National Security Council spokeswoman Bernadette Meehan said that over the weekend, ISIS sent the Muellers a message containing proof that Kayla had, in fact, died. “Once this information was authenticated by the intelligence community, they concluded that Kayla was deceased,” Meehan explained. Mueller, an Arizona native, was kidnapped in August 2013, after leaving a Doctors Without Borders hospital in Aleppo. She had been working to help refugees of the war in Syria since December 2012. U.S. officials are still unsure of how, exactly, she died.